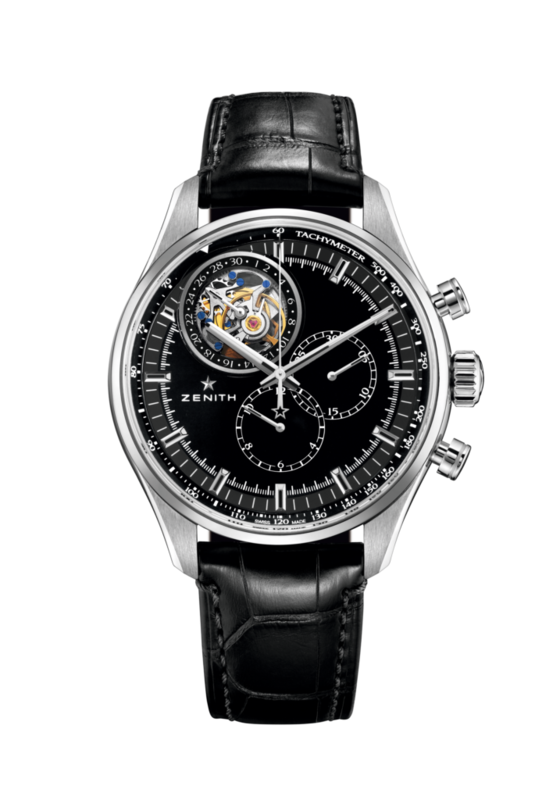 The new El Primero Tourbillon models offer a unique combination by associating a prestigious tourbillon with the high frequency (36,000 vph) of the world’s most precise series-made chronograph – the legendary El Primero developed by Zenith in 1969 – as well as a patented date display. These elegant tourbillon chronograph models come in two classic versions crafted in pink gold or stainless steel with a white or black lacquered dial, complemented by a contemporary version in brushed titanium with a slate grey dial. Beneath their understated elegance, the three new El Primero Tourbillon models conceal a mechanical heart characterised by fully mastered complexity. The iconic tourbillon complication is associated here with a legendary movement: the El Primero automatic chronograph calibre beating at the high frequency of 36,000 vibrations per hour. Its distinctive asymmetrical architecture places the tourbillon at 11 o’clock, while its offset tourbillon carriage is revealed through a generous dial opening. The tourbillon mechanism rotating once a minute also incorporates a small seconds display, while the patented date display appears on a disc placed around the circumference of the tourbillon carriage. The 45 mm-diameter case, crafted in pink gold or stainless steel for the two classic versions and water-resistant to 100 metres, is enhanced by a fluted winding crown and two round vintage-style pushpieces, endowing it with classic aesthetic appeal distinguished by beautifully proportioned lines. The cambered sapphire crystal, glareproofed on both sides, ensures optimal legibility of the white or black lacquered dial punctuated by luminescent facetted dagger-type hands and hour-markers. The remarkably slim central chronograph hand, blued on the pink gold version and bearing the Zenith star emblem, sweeps accurately around the graduated dial circumference and its inner bezel ring bearing a tachymetric scale. The 30-minute and 12-hour counters are respectively positioned at 3 and 6 o’clock so as to ensure optimal clarity on this pure, understated dial face. The sapphire crystal caseback affords a fascinating view of the automatic El Primero movement and the dance of its gold oscillating weight adorned with a “Côtes de Genève” motif.